When it comes to e-book readers, we aren’t exactly spoilt for choice compared to those who are on the lookout for a tablet for their needs. 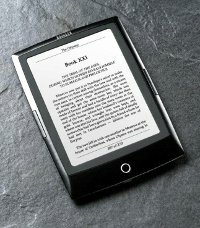 The world of e-book readers are not exactly brimming with new models, but that does not mean you have little or no options. No sir, a company like Bookeen has its fair share of e-book readers in the market which are already decent enough for everyday use, but to rest on their laurels is not something the company would do. Hence the Cybook Odyssey from Bookeen – read on to know more about the hardware specifications, but don’t ask about the price point since there is no word on it just yet. What makes the Cybook Odyssey so special from the rest of the pack? For starters, this is touted to be the first e-book reader from the company that sports High Speed Ink System (HSIS) technology. This is no fly-by-night technology, as it apparently took a couple of years of development to create that is said to revolutionize the electronic ink display industry. With the HSIS, the Cybook Odyssey can be said to be a pioneer when it comes to making way for a new generation of e-Readers that are touted to be faster, more reactive and more fluid. Electronic ink never really took off in a big way because there are still obstacles to it, but with HSIS technology, perhaps the stigma of owning an E Ink device will be dispelled. Not only will tablet users be impressed with the speed of the Cybook Odyssey’s display, it will not do away with the classic properties of electronic ink. It is said that HSIS technology inside makes it a whole lot more intuitive to use the e-book reader, where hardware manufacturers can now develop a new user friendly interface thanks to the advancements made in this area in the realm of tablets. I bought the cybook opus from this company and I will never buy any other reader from them. every 10 pages we have to reboot the machine, most often we must perform a hard boot. We have to open the ebook and put a nidle in a hole, insisting more that 5 minutes…. The Odyssey is nog perfect (startup is a bit wobbly) but is reading on it is a pleasure. I even like the choice of books that are already on the machine.